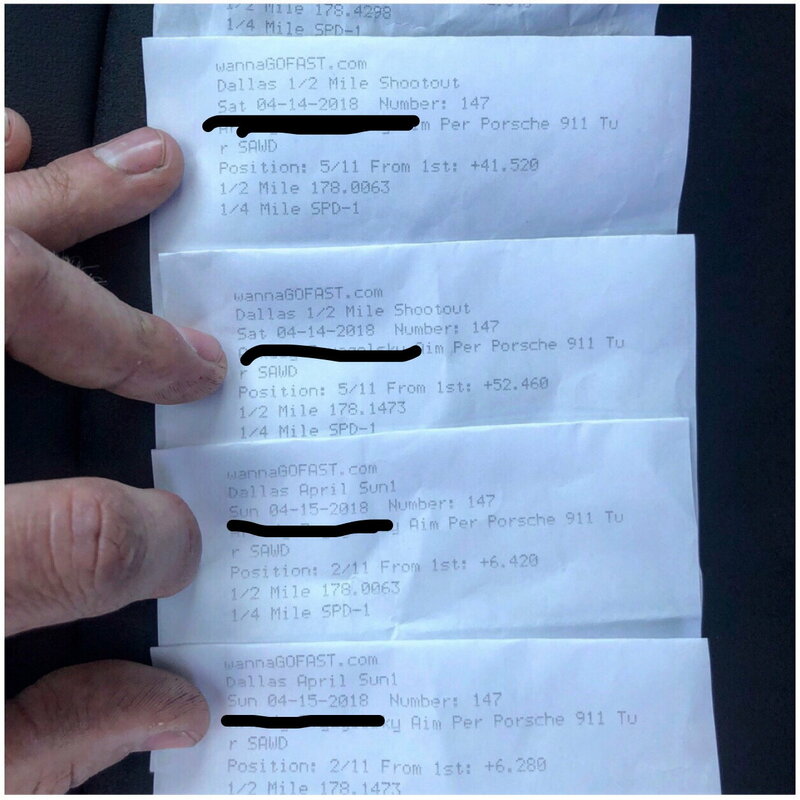 991.2 Turbo S 1/2 Mile - Stock MPH? Yes I would say 158-160. Like a stage 2 991.1 (which can barely edge out the 160). A stage 3 991.1 can run about 163-165 and stage 4 167-184 depending on how aggressive everything is set up. Keep us posted and have a great time! Let me know if I can help with anything or if you need any tips. Great post ! Never ran the 1/2 but really want to do it. I’m the 1/4, I mph more with a spinning launch vs a dead hook in my 2WD cars which is always a slower ET. Sounds like AWD is a different animal. Looking forward to test it out ! Yeah how well the turbo's launches on unprepped pavement definitely put it into a different category vs something rwd as its very efficient for the power level. Definitely do an event, times aside the fact you are able to take out your car and go wide open throttle for a half mile without having to worry about a ticket is worth the price of admission alone. difference that would have made but would have definitely like to see each method. That was 760 wheel and perfect traction, car ran the same thing over the course of the 2 days , 0-60 in 2.5, 1/4 in 9.75, it ended up doing the same thing to the last digit twice between saturday and sunday. I dont think anything else is capable of that consistency and thats what makes trying different stuff so easy. How much power was the c7z making? Its funny because I'm currently doing a Procharger F1A94 on my 17ctsv , so exact opposite lol, traction and consistency out the window but top end will be very nice. Great info - and it makes sense...the PC (mine is an F1A - not F1A-94) is mostly/all mid-top end. The car at this time made about 850 whp - trapped about 142-147 depending on DA (and traction). It went 10.0 with a 1.58 60' on DR's - no slick passes. I never wanted this car to race - but since we were some of the first in my neck of the woods to do this back in 2016-2017, I had to test it. I am fortunate to have a (by today's standards) middle-power build GTR that I race which is a true 1/4 and 1/2 mile car. You lose a bit of the bottom end responsiveness with the 94 - but it will pull more power up top. I wanted a more all rounder and stuck with the regular F1A. I have since added port injection, heads, forged rods and pistons, forged RPM trans, and a few other things for this season - but I won't be testing it - as it is going now that I am getting the Turbo S (GTR is going as well). I am pretty sure with just the additional fuel alone I would have went 180 - and with everything - probably lowish 180's. I will try all combos - but I see your point - if power is low-mid range - I need all of it for the first half to back half the best MPH I can. Just noticed my link did not post . Thanks for posting...this is something else. So - a few questions. Will the IC's have this much affect on a stock 991.2? Looking at this - it seems it's with a tuned car? I find it both hard to believe and concerning that a balmy day still causes timing retardation due to the fact the stock IC's are apparently horribly inadequate? This is even crazier. To be clear - he is saying stock tune - and only manifolds and exhaust? I know the DA was pretty fantastic - but damn. 10.3 1/4 at 134 MPH? 7.3x 60-130(!) 5.7 to 100 and 13.x to 150 - all still stock tune?! I am going to keep the car stock season one - 100%. And during that time - I am going to baseline the car many many times with many track and temp conditions. Depending on how I do - I may look into these bolt ons - as long as it is simple - and actually provides this kind of performance increase. My question is what will the gains be on regular/sub par DA days - still a 2-3 tenth and 2-3 MPH difference? I read a ton of posts about the IC’s being a problem with heatsoak. Typically near the end of the 1/4. That’s why mph is all over the board on stock 991.2’s. 128 to 131 is reasonable. Dropping boost at 1000ft depending on cool down is an issue. Onwards to the 1/2 mile is a bigger issue. Rough numbers out are around a 4psi drop at 50c IAT. Really depends on ambient and cool down. The vbox post, to me, is real data, but as you noted extreme outlier DA that I will never experience. But it is a data point. I will definitely look into both IC's and manifolds. More to research. Thanks T.
It all depends on what your goals are. There are many ways to do it so just depends what will be the best and most reliable way to get from A-B with longevity. I agree. I have been in the modding game a long time. My current cars are in the 900 and 1600+ whp range. At the moment - I am looking to keep this car - when I get it - stock. I don't want to remove my ECU to tune and I'm hoping yourself and ESMotors and all the brilliant Porsche Tuners will figure out how to crack the ECU so OBD direct port access is possible. Modding is not for the weak. It has its benefits and its challenges. That said - As someone who mods - it's always challenging to stay (at least fully) stock lol. Other than the launch , you will get bored with it quick lol especially since you are used to more . They are too smooth and drama-less from a pure feel perspective. Top end pull starts to feel like something once it traps at least 140. I can definitely see the IATs going high on a half mile pull with stock ICs although either iceing them down and having better octane will definitely help combat that. As as far as modding goes agreed completely but this is the one platform where you can have your cake and eat it too without any drawbacks , loss of drive ability ect . Which half mile event do you think you'll be attending? Last edited by arkadyzv; 03-08-2019 at 07:38 PM. It's funny you use a 140 MPH trap - as myself and many of my modding use it as a minimum power need (145 being completely accurate). Great point on octane being a smart solution. My bigger car is flex fuel, but I forget even without it, the higher octane can/may be somewhat of a shield. Do you mean the car stock you can have your cake and eat it to - or when modded? I do know it is a great platform for modding - better even than the GTR in terms of keeping the powertrain stock without as much worry. I will be going to Battlecreek Speedfest in Michigan. July 5-6. I have been to many 1/2 mile events - and this one is the best (well run and perhaps even more importantly - the best runway I have run on - super smooth, 7000 or 7500 ft - I forget - but no issues at all for shut down, no dust or debris). Shut down isn't great - but I have been on many a airstrip that their main runway was like Speedfests shutdown.